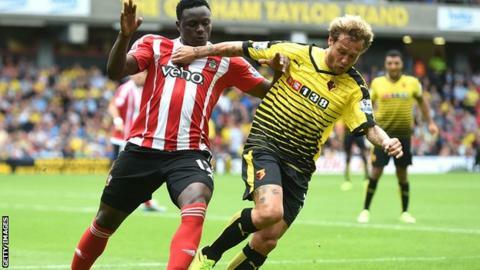 Southampton midfielder Victor Wanyama has returned to training "a different person", says manager Ronald Koeman. The Kenyan, 24, asked to leave the club during the summer amid interest from Premier League rivals Tottenham. He was left out of the side for Saints' 3-0 league win over Norwich on 30 August for not being "mentally and physically good enough to play". But Koeman said on Thursday: "Victor is back with a real focus, and if he's back like that, he's part of the team." The Dutchman added: "When I spoke to Victor yesterday, already it was a different person than he was in the last week of the transfer window. "We know that it was a hard fight but I think our statement was very clear to everybody: nobody for sale. "Victor said he would like to move, but now he has accepted he will stay, and I think that's the good way." Southampton are 10th in the table after four games, and face a trip to West Brom on Saturday.